Meet the new expense rules! In the last few months, we've been rebuilding Rydoo's expense rules from the bottom up. Thanks to your feedback on our product portal, we've been able to focus on what matters mostly. Today we are proud to present a set of expense rules that can be used to automate your expense policy and to make it more transparent for your employees. Approving or rejecting is an important part of managing your company's expenses. In the end, everybody wants this process to be as smooth and fast as possible. Your employees want to know what's in our out of policy and want to be reimbursed ASAP. Approvers on the other hand don't want to spend too much time going through the same small expenses every day. Most of these rejections can be avoided by giving clearer instructions to what's allowed and what's not. That's why it's important to have a good expense policy. If you're just starting or want to improve your expense policy, here are some tips and tricks. The next step is communicating these policies to your employees. With the new features we're launching today, this step will become easier than before. Over the last few months we've rebuilt the entire rule section and we're very excited to finally role it out to all our users. Via the expense rules, you have a lot more options to define the audience of a rule and also to select the necessary action. Through warnings, you can give direct and live feedback to the employee before submitting an expense. With powerful actions, you can create a rule and let a rule automatically skip steps of the approval flow. So how will it actually work? Expense rules can be set up via 4 simple steps. By adding the specifics to each step, you'll have endless options to copy your expense policies within Rydoo. If you prefer watching a video over reading, you can check out the following video . First, you need to select the users to whom the rules will apply. You can either select users on a branch, group or user level, or let the rule apply to everyone within the company. Secondly, you need to specify the criteria for which a rule should apply. Here you have the option to choose a category and further specify it by amount, receipt, or time of the week. You can even specify the rule so it only applies to certain countries, amount or currency. The different criteria can also be combined which allows for an endless possibility for options! Thirdly, actions allows you to set a warning that will appear when a user violates a rule. This will be a gentle warning that will show when the user tries to submit the expense. Additionally you can skip certain level of approvals or create a counter expense. A rule without a name is a pretty dull rule. Bring your rule to life by naming it and adding a description to it. 🔍 For more details, you can read our extensive help desk article, explaining all the different steps and options. Take your expense policy to the next level by automating your approval flow! Some expenses don't need much consideration to approve them. And nobody likes to have their expenses sitting idle in the approval flow. That's why we're now allowing you to set up automatic approval flows. Using the option in the action section, you are now able to fully automate approval and controlling. 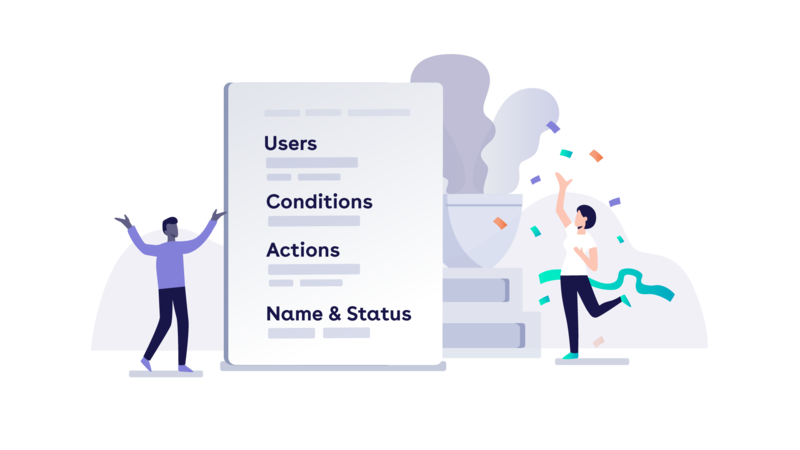 Just select auto approve, control or approve and control and the approver/controller won't need to waste time anymore approving/controlling these insignificant expenses. This will allow you to calculate the number of nights a user spends during a trip. The number can then be used in the expense rules which allows you to set a rule that limits the maximum amount an employee can spent per night. This one allows you to set a category and sub-categories and whenever the employee chooses the category of your choosing, they'll be asked if they would like to split the expense to the different sub-categories.